Summary: When a local man is murdered and a Native named Louie Sam is suspected of the crime, the charged atmosphere of 1884 demands justice. Unhappy when the Canadian law enforcement seeks a trial for Louie Sam, a lynch mob calling themselves the Nooksack Vigilance Committee crosses the Canadian/United States border and strings him up to hang from a tree. George Gillies and his friend Pete Harkness are observers of the act, and afterwards George finds himself questioning the ‘facts’ of the case. As he pieces what really happened to Mr. Bell together, his challenge is trying to convince others to care about the miscarriage of so-called justice that has taken place. Review: Set against the historical backdrop of Canada’s only lynching, George Gillies is a fifteen year-old learning to ask questions and think for himself. In 1884, living in a society of settlers whose wounds are still fresh from the American Civil War as well as many skirmishes with the Natives, this is not an easy task. In his eagerness to prove his manhood, George follows a riled up lynching mob as they kidnap a Native boy named Louie Sam and hang him for the murder of Mr. Bell without evidence or a trial. Except as soon as George sees Louie Sam, he knows the ‘facts’ he has heard from others can’t be right. Louie Sam is practically a child, and George can’t imagine him being as vicious as he has been described. But even with his doubts, the mob-mentality controls the situation, and George and his father have little opportunity to stop Louie Sam’s hanging. When it’s all over through, George is changed. Determined to find out the truth of who actually committed Mr. Bell’s murder, once George starts asking questions he can’t stop, and the answers often aren’t pretty. Through The Lynching of Louie Sam, author Elizabeth Stewart thoughtfully explores one young man’s coming of age after realising the adults he used to trust have personal and sinister motivations. She weaves together historical fact with George’s personal journey of awareness, and the effect is a story is gripping and informative. George himself is a character with admirable traits in a complicated situation. His struggle between wanting to get the truth out in the open and the resistance to acknowledge what actually happened he meets with all those in positions of power is frustrating and demoralizing. There is never true justice for Louie Sam as Stewart tells us, but through the act of writing about how others were affected by Louie Sam’s lynching, she lets her reader be unforgettably affected too. But my favourite part was Stewart’s preface where she lays everything out honestly by saying her book is George’s story, and the personal story of Louie Sam remains untold. 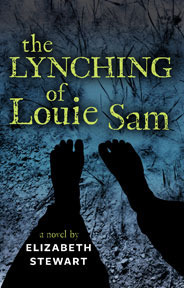 The Lynching of Louie Sam by Elizabeth Stewart is published by Annick Press, (2012).